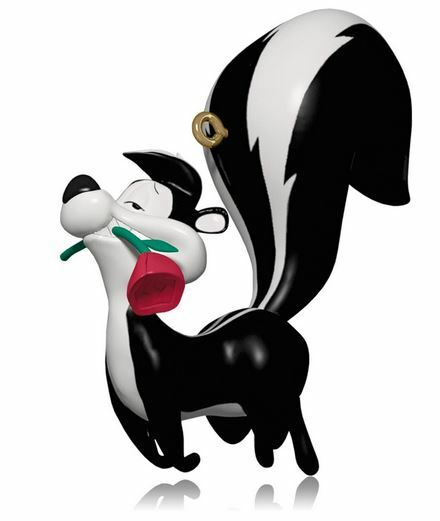 Ah, it's Pepe Le Pew and love is in the air. His eyes are half closed and he carries a rose in his teeth, no one can resist. Dis Pepe doos not stink! Fabulous Pepe Le Pew ornament! I've never seen him captured on an ornament where he's doing his famous little 'love hop', when he is "looking somewhere for you's" to a cat that "is just a little shy, no?" I'm pleased that the ornament can be both hung from the tree, or displayed on his feet and will not fall over - I like that in ornaments. Pepe was sent with complete love and enjoys his box, when he is finished pursuing his love for Christmas. My mother will absolutely love him - Thank you and au revoir! My husbands nickname is Pepe so everytime I see a pepelepew I get it for him. The decoration is fantastic.